I go out of town for a week and the DOE tries to slip another LNG export facility approval by me! The latest approval is for approximately 2 Bcf/day from Lake Charles Exports, LLC, a joint venture of BG Group (partners with EXCO Resources in the Haynesville Shale) and Energy Transfer Equity, LP, which purchased Southern Union Co., the original partner, last year. The approval is to export gas to countries that don't have free trade agreements with the U.S. The facility still needs FERC approval, but that shouldn't be quite the same politicized soap opera. 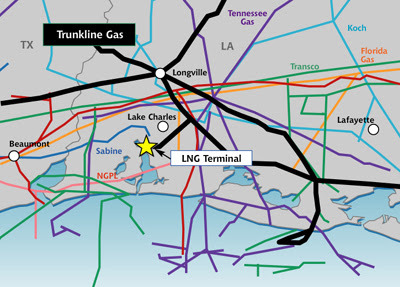 The Lake Charles facility would be built in three trains on the existing Trunkline LNG import facility, which is already connected the natural gas "grid" through existing pipeline infrastructure. For those keeping count at home, this is the third LNG export facility to be approved by the DOE after Sabine (LA) and Freeport (TX) and also the third to be a conversion of an import facility. It is also the third facility located in spitting distance of the Haynesville Shale. The three Gulf Coast approvals to date provide approximately 5.6 Bcf/day of export capacity, if built. Next in the queue is the Dominion Resources Cove Point facility in Maryland, which follows the same pattern of an existing import facility looking to reverse the transaction. The big difference is that Cove Point is near the Marcellus Shale.